Wow this time of year always seems to come around quickly, but I absolutely enjoy it. My mind does go crazy with the many ideas and recipes people love to share. The first thing that comes to mind is Gingerbread Cookies or anything gingerbread really. I just love the warmth and comfort it bring me when I eat anything with gingerbread spices. Preheat oven to 180’C/160’C fan forced and line or grease, with butter, 2 baking trays. Use an electric beater to beat the butter and sugar until pale and creamy. Add in the golden syrup and egg yolk and beat until combined. Stir in the flour our, ginger, mixed spice and bicarbonate of soda. Turn onto a lightly floured surface and knead until smooth. Roll dough into a ball and flatten in to a disc. Cover with plastic wrap and let rest for 30min in fridge. On a lightly floured surface roll dough out to about 4mm thick. Use cookie cutterc to cut out shapes and place on trays about 3cm apart. Repeat with leftover dough. If dough is difficult to roll and is falling apart put back into fridge to harden. Bake in for approx. 10 minutes or until brown. Keep and eye on them! 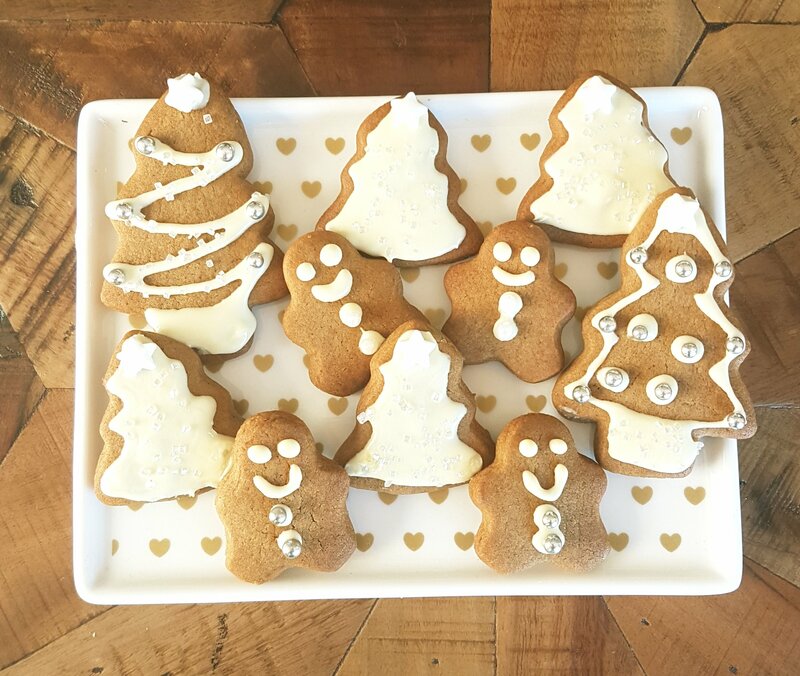 If making smaller or larger gingerbread shapes adjust cooking times. Transfer on to a rack to cool. Once cool its time to decorate! I use white chocolate to decorate or as glue to stick on choc chips, m&ms or sprinkles. Royal icing is more commonly used, especially for a ginger bread house, it is good for sticking and holding tight so the walls do not fall down. Can be stored in airtight container for up to a week. Dough can be left in fridge for a week or Freezer for up to 2 months..
Royal Icing- beat egg white until soft peaks and gradually add icing sugar. Add lemon juice and beat until stiff peaks. Can put in piping bags air tight and place in fridge until ready for use, remember as soon as air touches the mixture it will start to harden. White Chocolate- Melt in microwave bowl in 10 second lots and stir until smooth. Place in piping bag or zip lock bag and cut tiny bit off corner.